Note: Photos taken during of a safety video during a training class, not of optimal quality, but enough to capture a pretty unique airplane and its emergency procedures. I have returned back to Palmdale, CA, the base of operations of NASA’s Stratospheric Observatory for Infrared Astronomy, SOFIA. This week there are scheduled two flights to 40,000 feet to complete commissioning activities of the FORCAST mid-IR imager with grism complement and some firsts cience activities of the Cycle 1 period. The two flights are Tues Jun 11thand Thurs Jun 13th, sunset to sunrise. Tuesday marks my first flight on SOFIA. Being a newbie, I am required to attend egress training. I took this class along with a student fromIthaca College who is helping with our grism data pipeline and four SOFIA AirborneAmbassadors, education specialists from El Paso, Texas. All the other flyers have had this training. 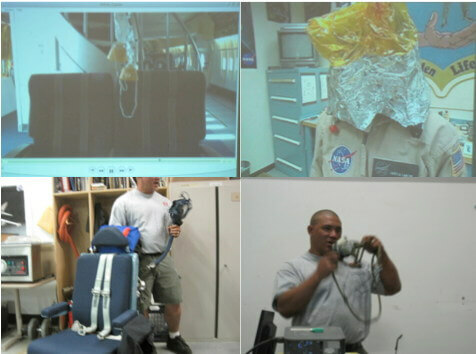 For more information about the SOFIA Airborne AmbassadorProgram, check out this link: http://www.seti.org/sofia. The briefing started with a description of the location of the exit doors, and hatches. To note in this 747SP there are no over-the-wing exits, and no floor lighting to illuminate the path out. The two side doors act just like any other jet egress doors, each equipped with an evacuation slide.And no, we did not test the slide deployment on the plane, as that costs tens of thousands of dollars to repackage the slide and recertify it for flight. A lot of discussion was about the location of the oxygen masks and life preservers because depending where you are sitting on the plane,or what station you are at during flight, the location varies. We were shown a multitude of oxygen masks. The figure below shows top left: standard drop-down masks that we are commonly familiar with, top right: EPOS, or emergency passenger oxygen system (also known as a smoke hood), bottom right: the masks for the pilots and the mission manager (also includes a communication system),and bottom left: portable oxygen tank which is part of some of the special seats on the telescope deck. There are masks in the toilets, and some are portable to carry with you if you are moving about the cabin. The presentation was a video plus a hands-on demonstration. We went over locations of the fire extinguishers, first aid kits, AED (automated external defibrillator)and emergency survival kits. On each flight, there will be 6 crew members, with 4 up on the upper deck (pilot, co-pilot, flight engineer and tech) and 2 safety techs on the telescope deck. But with on order 20-30 passengers scattered between both decks it really is important to know where all this special equipment is located. Nothing is standard on this 747SP. We looked through the emergency survival kit and handled the different radios and beacons in case we need to assist the crew. We also learned that the Mission Manager serves as the main point of contact for direction in case of an unexpected emergency. The next step in my SOFIA adventure will be a crew briefing on flight day around 5pm, where specifics of each flight leg will be described.There will be an on-board safety summary as well. I was out here for line ops two weeks back and I have to admit I never really looked for the safety equipment, so rest assured now that I now what I need to look for, I can spot the equipment exit areas that were discussed in the briefing tonight! I close with a still I took from the safety video showing the escape hatch from the upper deck of the 747SP. Apparently you have to grab hold of a special handle (and there only a few) and rappel down. I really hope it does not come to that, but I am glad I know about the upper hatch, escape routes down through the nose gear and side doors. Previous PostAdieu from Palmdale, CA, for now, until returning for SOFIA commissioning flightsNext Post“Contents may shift during your flight.” Well, I may have, but not this 2.5 meter diameter telescope aboard SOFIA.